Office of Faith Formation - "Building Households of Faith"
Faith-Formation is an inclusive term used to define a life-long learning process. It is an effort by the entire faith community to embrace the teachings of the Gospel, come into relationship with Jesus Christ, and live out one's faith through love and service. Luke 17:11-19 In Luke's Gospel, we hear about a person who was given a great gift by Jesus and was praised for his response. Why did only one person return to Jesus to offer his thanks? What reasons might the others have had for not returning? There are many ways we say thank you to God, by participating in the Mass, prayers, community/family involvement, acts of kindness/respect. The Office of Faith Formation is open Monday - Thursday, 1-5pm and 6-8pm. Registration for SEEDS 0-36 months and their Parents is open enrollment. Sprouts, 3, 4 & 5 year olds, there is some space available for both the 8:30am and 10am sessions. Registration for 3-5 CLUB, 3rd, 4th and 5th grades, is open enrollment. Registration forms can be found on the Faith Formation website. First Communion is full for both years 1 & 2, including our Spanish classes! 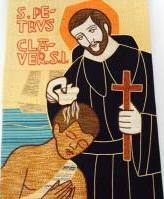 St. Peter Claver Youth Ministry is on a mission to engage our community in setting the hearts of youth and their families on fire for Jesus Christ and his Holy Church and launching them into the world more fully equipped to live, love and serve as his disciples.